U.S. Attorney General Loretta Lynch made an appearance on The Late Show with Stephen Colbert Thursday night where she defended the FBI and the court order requiring Apple to create a version of iOS that doesn't include passcode safeguards. Her stance: Apple needs to do what their customer wants and create a way to unlock the iPhone San Bernardino County issued to Syed Farook. First of all, we're not asking for a backdoor. And nor are we asking [Tim Cook] to turn anything on to spy on anyone. We're asking them to do, is do what their customer wants. The real owner of the phone is the county—the employer of one of the terrorists who's now dead. That terrorist would be Syed Farook, who opened fire with his wife on their San Bernardino County Department of Public Health coworkers last December. They killed 14 people and injured 22 others before being killed themselves in a shootout with police. Mr. Farook's county issued iPhone was recovered by law enforcement, but protected with a four-digit passcode. The county didn't have the iPhone on a mobile device management service, so there wasn't any way to unlock the device to see if it held important information related to the shooting. Apple helped the FBI recover as much data as it could, but doesn't have any way to bypass the passcode security features that will destroy the phone's data after ten failed login attempts. The FBI then turned to the Federal Court system to get its order compelling Apple to create a special version of iOS that strips away those features preventing a brute force attack on the iPhone's passcode. Apple filed a motion to vacate the order and also filed a formal complaint with the court saying the government doesn't have the authority to force a company to create forensic tools that threaten privacy and security. The company also said the order sets a dangerous precedent where the government could force any company to weaken the security and encryption of the devices they make. Mr. Colbert also asked about the "slippery slope" argument that claims once the government successfully forces Apple to bypass the passcode security features it could demand companies add new features to operating systems allowing remote activation of smartphone cameras and microphones for surveillance. Ms. Lynch dismissed the idea saying, "What we're asking them to do is to help us disable the password erase function that basically wipes the phone if you guess the password wrong after ten times. We will try to get into the phone, we will extract the evidence, under the court order we've gotten. It's very narrow and very focused." Both Apple and the Department of Justice have made their arguments in the case very public. Apple CEO Tim Cook spoke out against the court order in an ABC interview, Craig Federighi did the same in a Washington Post op-ed, and Eddy Cue followed suit in a Univision interview. FBI Director James Comey penned his own op-ed for Lawfare, and Ms. Lynch previously defended the government's position on Fox News, too. Apple and the FBI will argue their positions in court on March 22, and it's a safe bet we'll be seeing more public commentary from both sides before then. 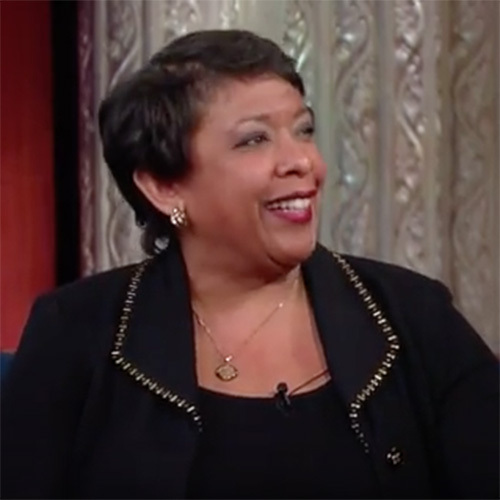 Ms. Lynch's comments on the case run from about the 3 minute mark and wrap up about 4:18.